This TIP, Substance Abuse Treatment: Group Therapy, presents an overview of the role and efficacy of group therapy in substance abuse treatment planning. This TIP offers research and clinical findings and distills them into practical guidelines for practitioners of group therapy modalities in the field of substance abuse treatment. 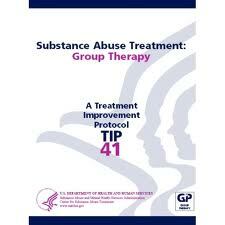 The TIP describes effective types of group therapy and offers a theoretical basis for group therapy's effectiveness in the treatment of substance use disorders. This work also will be a useful guide to supervisors and trainers of beginning counselors, as well as to experienced counselors. Finally, the TIP is meant to provide researchers and clinicians with a guide to sources of information and topics for further inquiry. 5) List the criteria for placing a client in a group, including cultural and ethnic considerations. 8) Review the purpose and value of clinical supervision, and how to get training to be a group leader . as depression, isolation, and shame. and they can help people grow in ways that are healthy and creative. services, comparable in efficacy to those delivered in individual therapy. counselors in enhancing their therapeutic skills in regard to leading groups. including alcohol and drug counselors, group therapists, mental health providers, and State government representatives. This TIP comprises seven chapters. Chapter 1 defines therapeutic groups as those with trained leaders and a primary intent to help people recover from substance abuse. It also explains why groups work so well for treating substance abuse. Chapter 2 describes the purpose, main characteristics, leadership, and techniques of five group therapy models, three specialty groups, and groups that focus on solving a single problem. Chapter 3 discusses the many considerations that should be weighed before placing a client in a particular group, especially keying the group to the client's stage of change and stage of recovery. This chapter also concentrates on issues that arise from client diversity. Chapter 4 compares fixed and revolving types of therapy groups and recommends ways to prepare clients for participation: pregroup interviews, retention measures, and most important, group agreements that specify clients' expectations of each other, the leader, and the group. Chapter 4 also specifies the tasks that need to be accomplished in the early, middle, and late phases of group development. Chapter 5 turns to the stages of treatment. In the early, middle, and late stages of treatment, clients' conditions will differ, requiring different therapeutic strategies and approaches to leadership. Chapter 6 is the how-to segment of this TIP. It explains the characteristics, duties, and concepts important to promote effective group leadership in treating substance abuse, including how confidentiality regulations for alcohol and drug treatment apply to group therapy. Chapter 7 highlights training opportunities available to substance abuse treatment professionals. The chapter also recommends the supervisory group as an added measure that improves group leadership and gives counselors in the group insights about how clients may experience groups. abuse. Readers should attend to the context in which the term occurs in order to determine what possible range of meanings it covers; in most cases, however, the term will refer to all varieties of substance use disorders described by DSM-IV. The sections that follow summarize the content in this TIP and are grouped by chapter. Because human beings by nature are social beings, group therapy is a powerful therapeutic tool that is effective in treating substance abuse. The therapeutic groups described in this TIP are those groups that have trained leaders and a specific intent to treat substance abuse. This definition excludes self-help groups like Alcoholics Anonymous and Narcotics Anonymous. Group therapy has advantages over other modalities. These include positive peer support; a reduction in clients' sense of isolation; real-life examples of people in recovery; help from peers in coping with substance abuse and other life problems; information and feedback from peers; a substitute family that may be healthier than a client's family of origin; social skills training and practice; peer confrontation; a way to help many clients at one time; structure and discipline often absent in the lives of people abusing substances; and finally, the hope, support, and encouragement necessary to break free from substance abuse.